Puffy Paws Kitty Haven is the only local recuse that post operating expenses on-line when they are paid. Puffy Paws Kitty Haven is the only local recuse that post operating expenses on-line when they are paid. 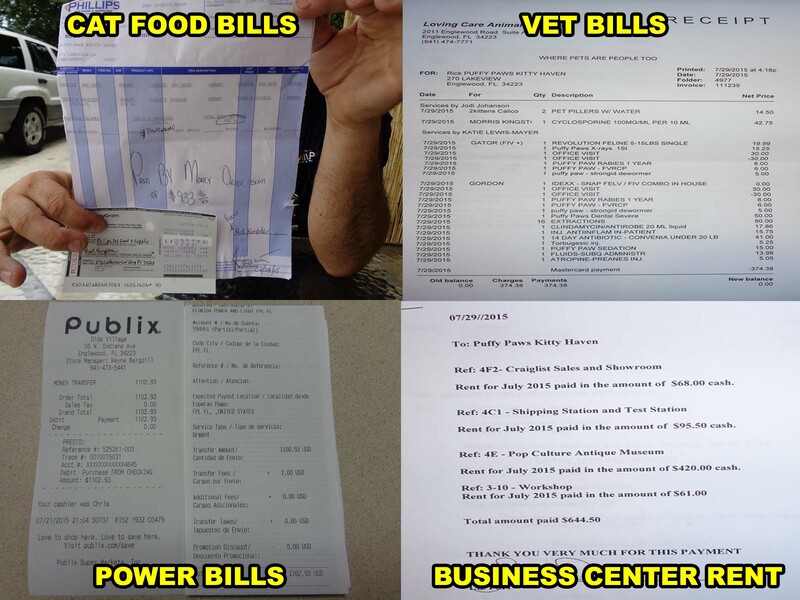 The Cat Food Bills, Vet Bills, Power Bills & The Business Center Rent. Also we send them out, to the kitties world wide family via our SOS's and updates, we send out each week. The kitty lovers of the world deserve to see where their hard earn donations go. We believes in 100% transparency in all of our dealings. Chrissy and Rick do not get paid. 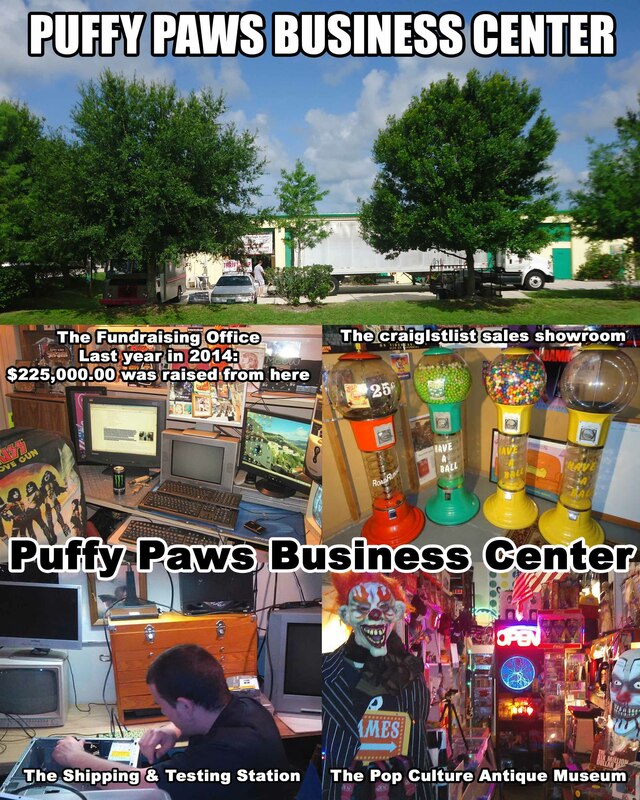 100% of all donations goes into running Puffy Paws. 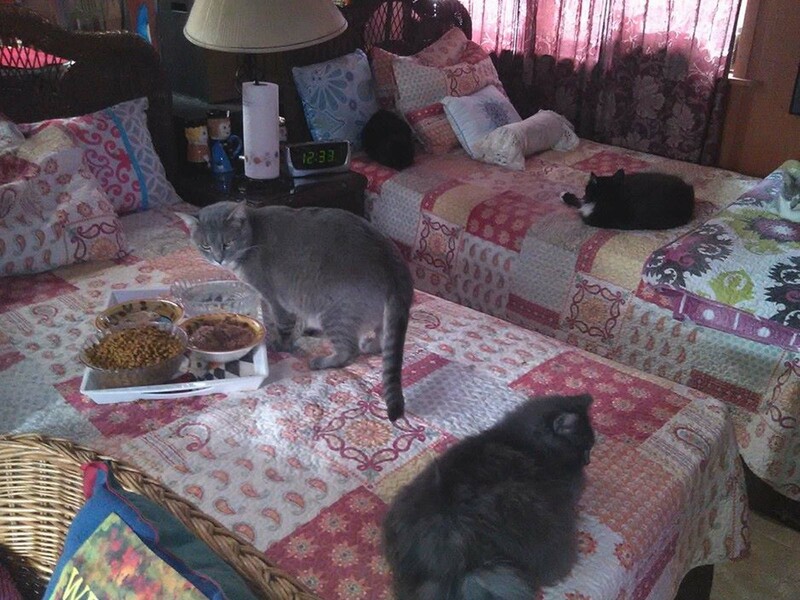 The priority of incoming funds are in this order, the kitties daily needs, cat food, vet care and operating expenses. After that, funds are used for the maintenance and improvement of the Haven for the kitties and the care and maintenance of the vehicles. Just by asking for help when the kitties need it. The unwanted & special need kitties are blessed to have a world wide family that loves them ever so much. Thank You !! The operating expense page is designed to let the whole world know were their donations go and why and when they are needed each and every month. Since the airing of the Video in October 2008 on Pet Pulse and being on the NEW YORK POST web site. 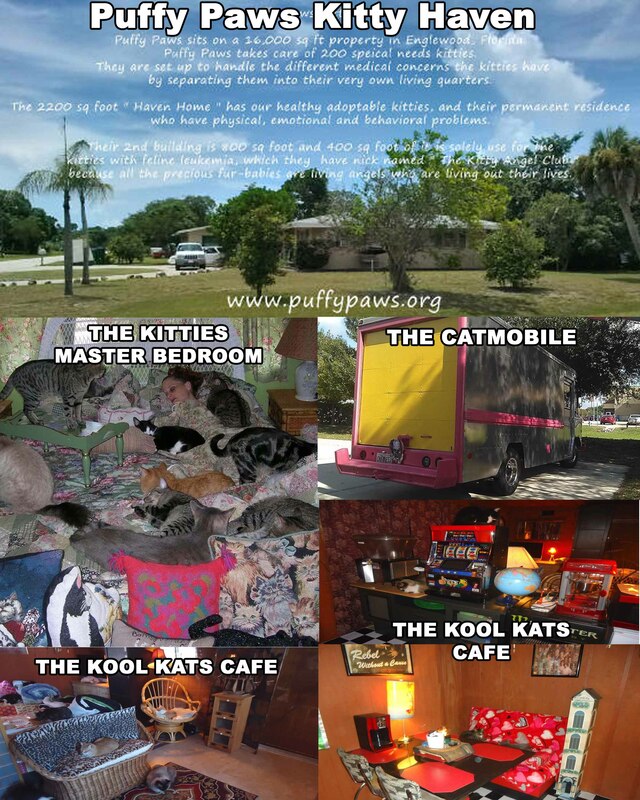 The kitties have doubled and it cost well over $30,000.00 a month to run Puffy Paws Kitty Haven. Puffy Paws cares for kitties with feline leukemia, FIV, feral cats, unadoptable kitties, one eye cats, senior kitties, kitties that do not use their litter box, abused kitties, cats with neurological disorders, abused kitties and more - basically unwanted and unadoptable kitties that would be euthanized elsewhere. 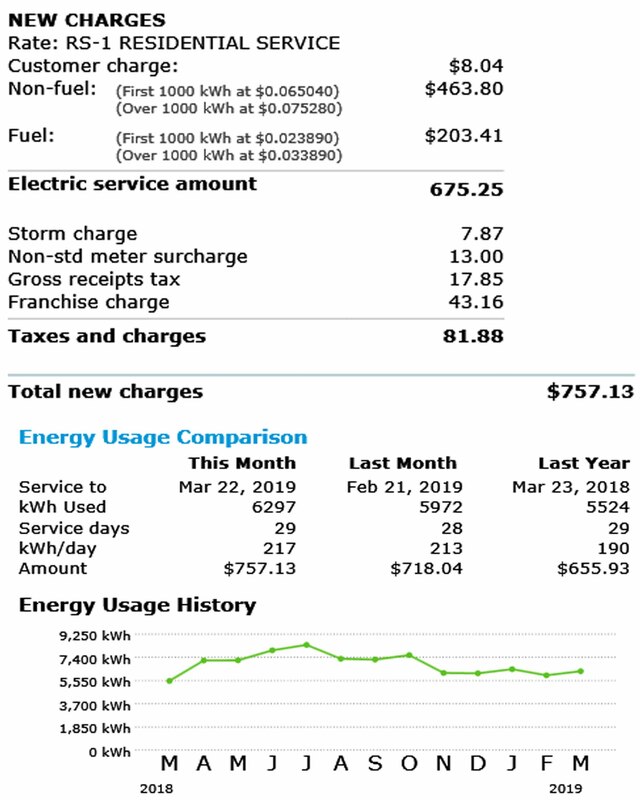 Last month in March - 2019 - $30,401.00 was donated. $25,259.88 of that was donated by the kitty lovers of the World via PayPal. The remaining amount was donations via checks and sales from the online stores. Last year in 2018: $561,557.04 was donated. Of the $561,557.04 - $355,635.75 of that was donated via PayPal, by the kitty lovers of the world. The unwanted & special need kitties are blessed to have a world wide family that loves them ever so much. Puffy Paws Kitty Haven believes in 100% transparency in all of our dealing. Chrissy and Rick do not get paid. 100% of all donations goes for the kitties daily needs and operating expenses. The operating expense page is designed to let the whole world know were their donations go and why and when they are needed each and every month. The Business Business Center servers many functions and encompasses all of our business activities. 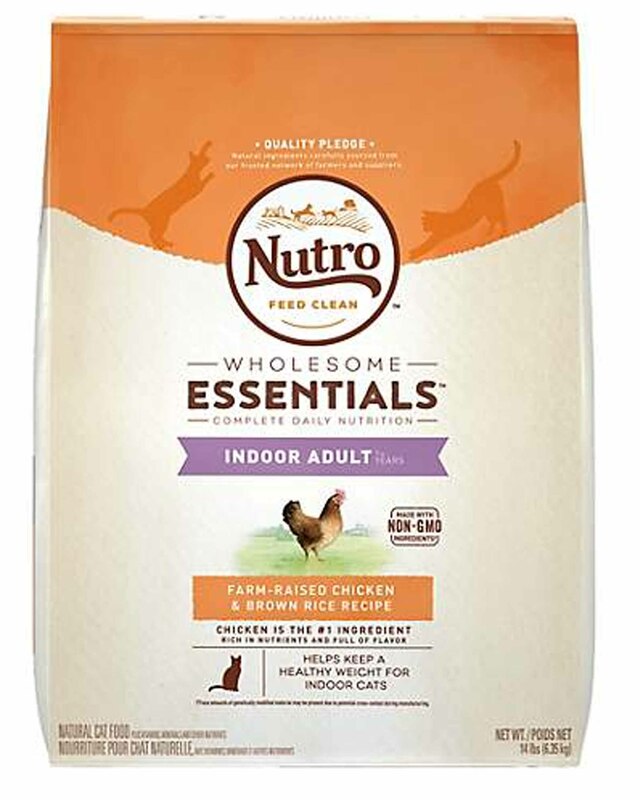 We purchase the cat food wholesale and that is a savings of over $10,000 a year. Phillips Pet supply will not delivered to the Haven since we are in a residential neighborhood. 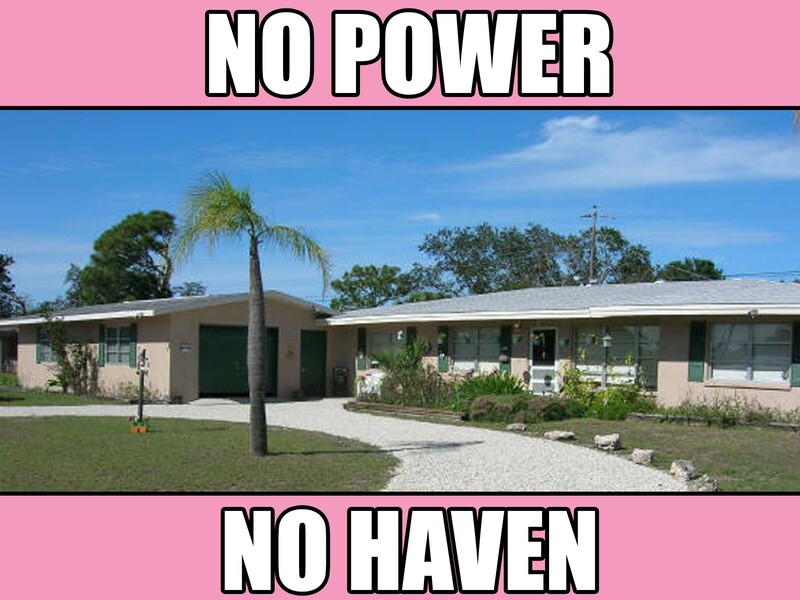 No business activities per code enforcement. We can not have foot traffic at the Haven. All the owners give ups are conducted at the Business Center. We use the Business Center office as the off site quarantine room, which we were able to save 100's of kitties through out the years because we could quarantine them at the Center's office. If we did not have the Business Center office those kitties will be dead because we could not take them in. The Business Center is where our business office is. The on-line fundraising is conducted at the Center's office. We are not a traditional rescue and our fund raising is anything but traditional. Last year in 2015: $333,000.00 was donated. 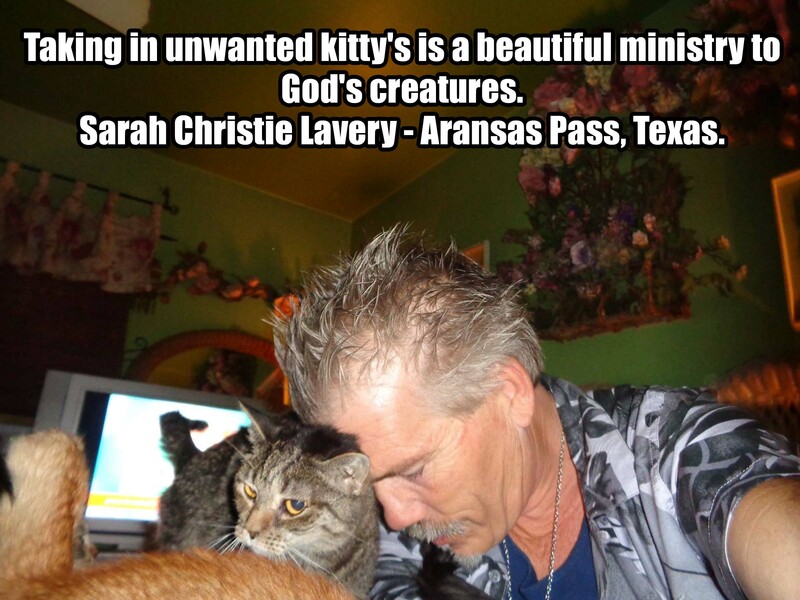 Of the $333,0000.00 - $308,835.83 of that was donated via PayPal, by the kitty lovers of the world. The rest was checks and monetary donations from the Pop Culture Antique Museum. The majority of these funds were raised at the Business Center's office. 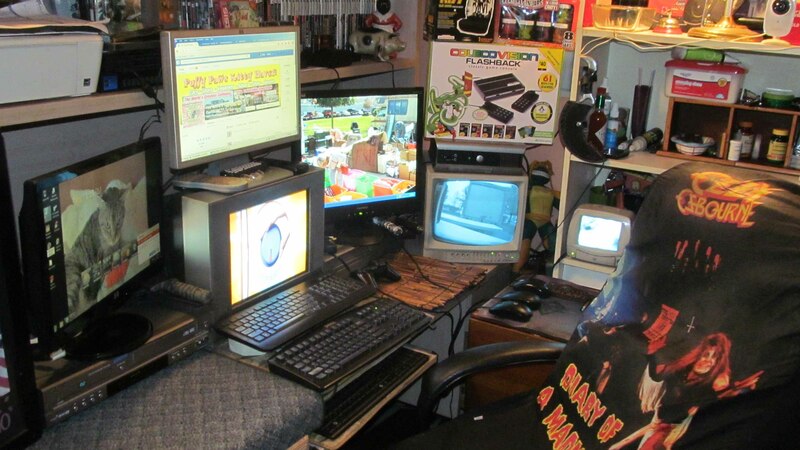 The Pop Culture Antique Museum ( $420 ) is located at the business center. & The Business Center Workshop ( $61 ) . Metro Cell Phone Bill - 2 Lines -$103 Per Month. * It costs around $275 -$300 dollars a day for the daily supplies. IT COSTS $4.84 TO FEED EACH KITTY A WEEK AT PUFFY PAWS. IF WE CAN NOT COME UP WITH $967.55 EVERY FRIDAY. 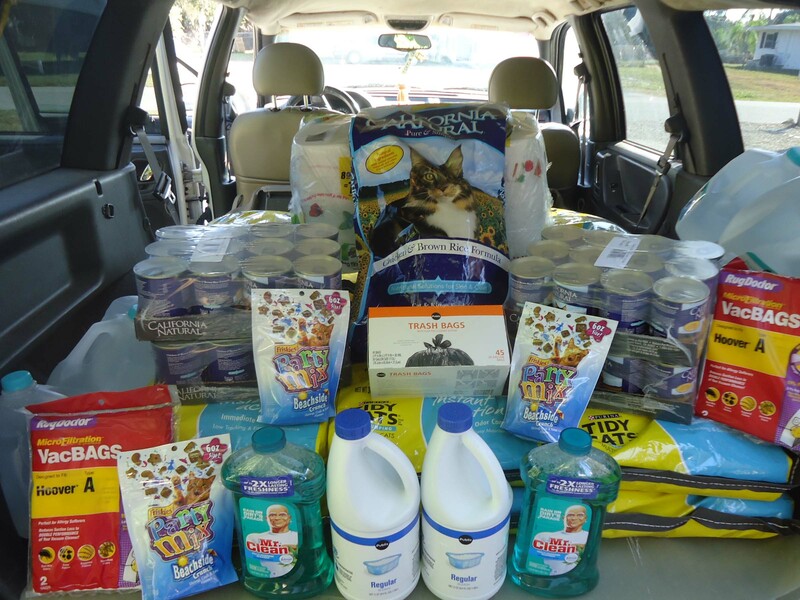 THE TOTAL WEEKLY COST TO FEED 200 SPECIAL NEEDS & UNWANTED KITTIES. WE CAN NOT KEEP THE DOORS OPEN. WE WILL KEEP YOU UPDATED AS THE FUNDS COMES IN EACH WEEK FOR THE C.O.D PAYMENT EVERY FRIDAY. THE KITTIES EAT A WEEK. Plus A $14 Delivery Charge. 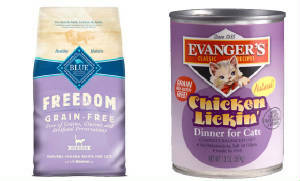 By using the Shopping Cart on this page, you may donate to pay for 1 case of wet cat food, a bag of dry, or more. Or you may make a donation of your choice. A $3 $5 $10 donation is like a miilion bucks to the kitties. It is all up to what your heart and budget can afford to take care of the kitties. 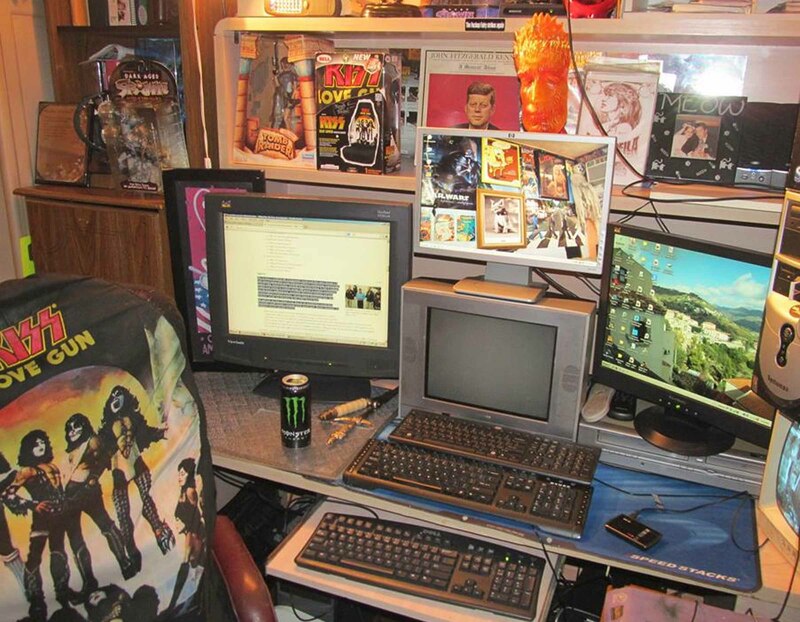 This is our life blood in raising donations. * In 2016 we have spent $46,234.92 at the vet. * That breaks down to around $231 per cat in 2015. * In 2015 we have spent $44,032,23 at the vet. In 2014 we have spent over $33,000.00 at the vet. That breaks down to around $150 per cat. We are so proud of the kitty lovers around the world coming through week after week for the best health care for the 2nd chance kitties at Puffy Paws. Thank you so much. Mad Kitty Love. * Being a Cat Hospice Vet care is provided at cost from the great folks at Loving Care Animal Hosptial. * The vet care for the kitties usually runs $4,000 a month. 3. 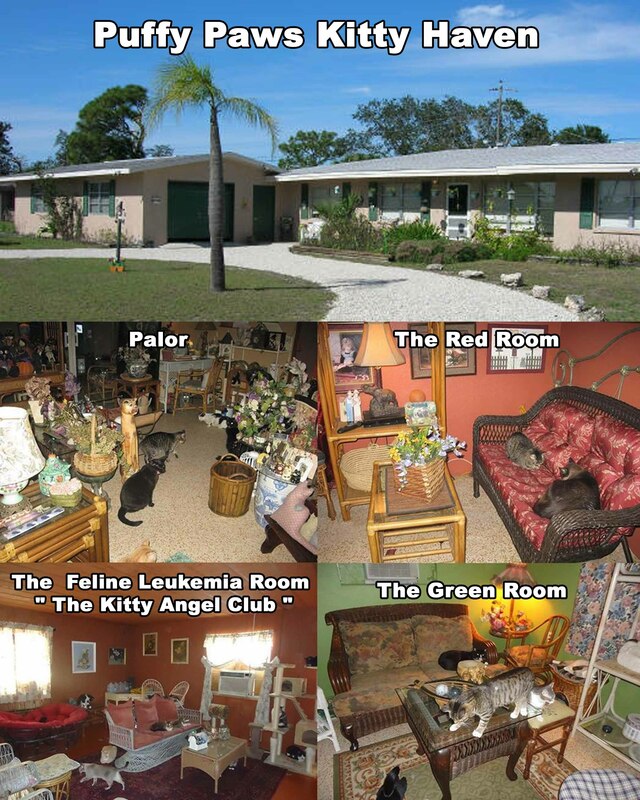 Call Loving Care Animal Hospital To Put Funds On Puffy Paws Kitty Haven Account at 941-474- 7771. YOU ARE MAKING A DONATION TO PUFFY PAWS KITTY HAVEN WHEN YOU USE THE SHOPPING CART. SO WE MAY PAY THE CAT FOOD BILL. The health of the kitties is at sake if we ever get a flea infestation. So hence: Operation PetArmor - Prevention Is The Best Medicine. With out the support and the love of the kitty lovers around the world, we could never do what we do for the kitties under our care. Please only donate what your heart and budget can afford because without you we can not make it. Thank you for your understanding and continue support. 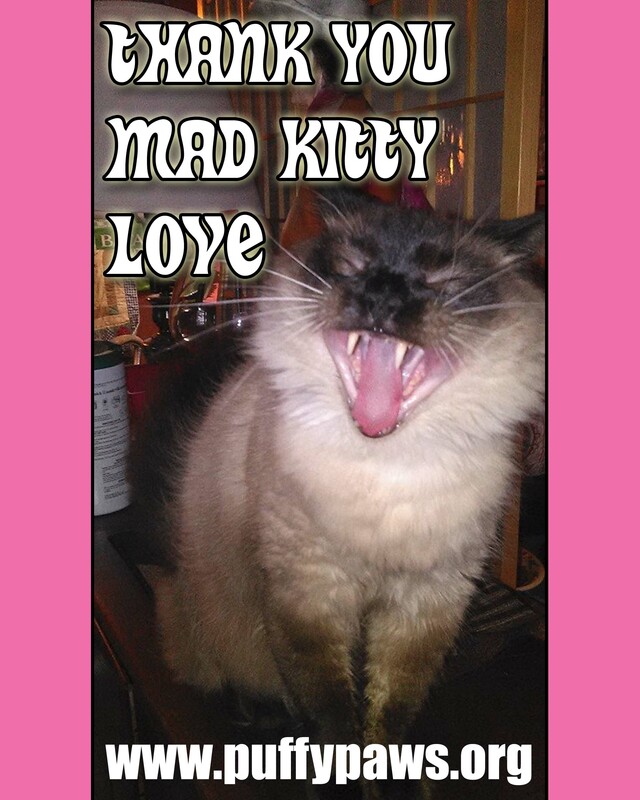 Mad Kitty Love To You All & Paws Up !!! Founders Puffy Paws Kitty Haven. Every week we reach out to the kitty lovers of the world , so we can feed the kitties for the following week. 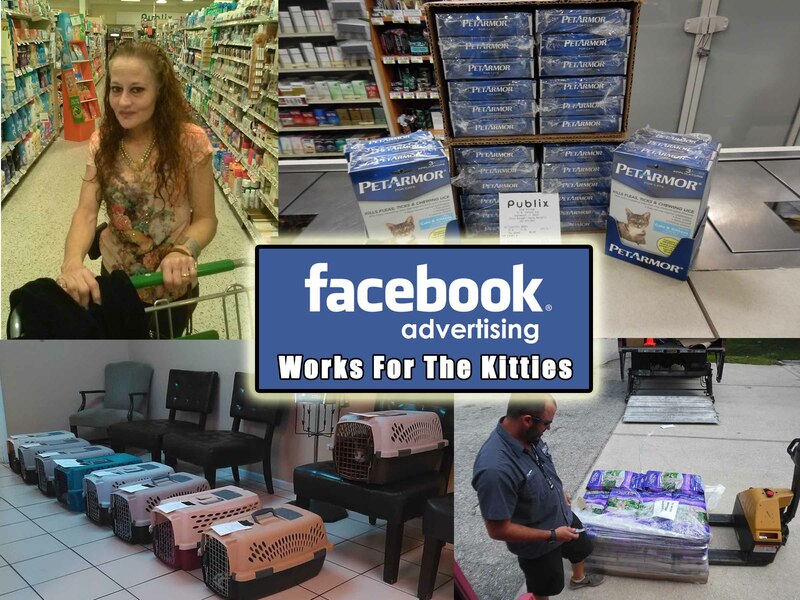 Each and every week, we must ask the kitty lovers of the word for help, to feed the kitties, this is why you are seeing us in your facebook news-feed. We have no other options without local support ,the kitties daily survival depends upon the charity of the kitty lovers around the world, each and everyday..
One of the main reason we can feed the kitties is that we are boosting our fundraising posts on facebook every week. Phillips Pet Food & Supplies has been a family owned and operated business since 1938. 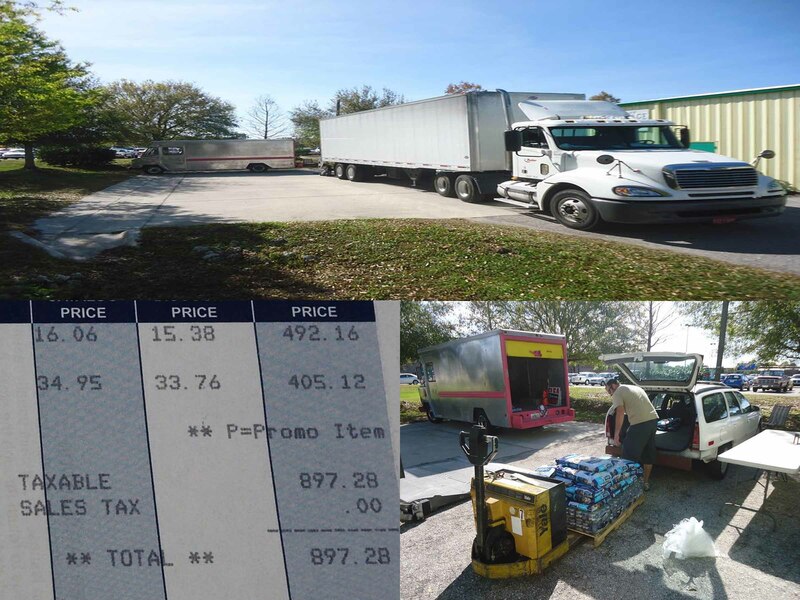 Phillips is the premier pet food and pet supply distributor with 12 distribution centers and it is C.O.D every Friday. Puffy Paws Kitty Haven saves over $10,000.00 a year buying the kitty food wholesale instead of retail like we used to. It will be such a disaster when Phillips Pet Food & Supply tries to delivered the food on Friday and we can not pay for it. In the contract that we signed non payment of goods ordered will be dealt with cancelling the account. 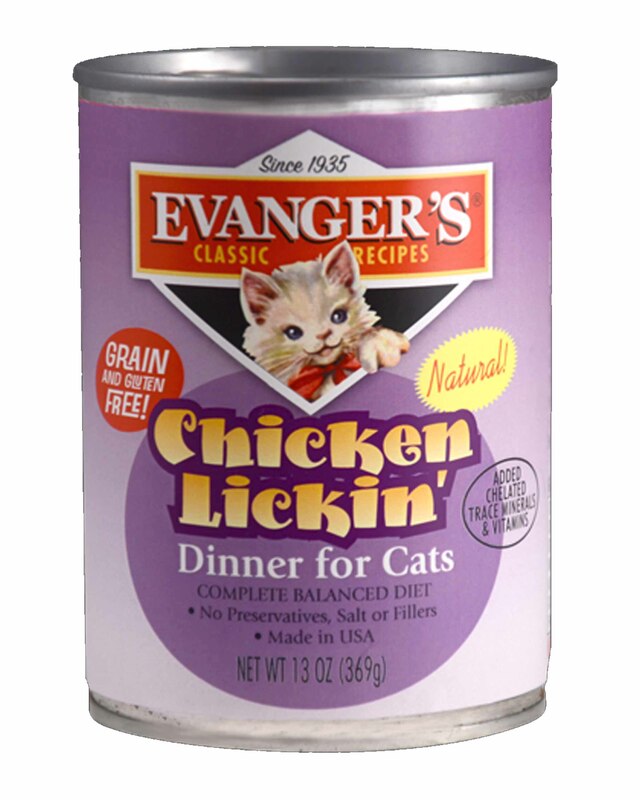 The kitties can not go on without cat food. That will be inhumane . If we failed at raising the funds for the kitties food there will be no other option but to close down. What choice would we have? An entire cat hospice will be wiped out and only painful and sad stories will be told because we could not round up the worldwide awareness and financial help these beautiful cats deserve. When we ask for help on facebook the whole world listens and helps by caring,sharing,sending power of light and love,praying and donating when feasible. We have done every thing we can to get the food cost, lower yet their is no way to get around that we are taking care of 200 kitties who are living life to the fullest,24/7. We can never thank you enough for all that you do for the kitties at Puffy Paws.